One of the harshest words when we’re struggling with grief and the death of someone we love is, if. “If’s” can haunt us in the throes of grief: "If he had tried a different medicine...If I had one more chance to talk with her…If I would have done what I said I was going to do before he died…If we would have found out about the tumor sooner…" If, if, if. No one expected Dan’s mom to have come up with the right medical answer for Cynthia, even if there was one. But that’s the irrationality of grief. We bargain, negotiate and imagine different outcomes if—if only we could go back and change the past. If only we were omniscient and omnipresent, we would have seen what was coming and made a different choice before our loved one died. We grieve the physical loss of the person, and then we lament our powerlessness to prevent death. If there is one area of life where we must confront our own powerlessness, it is in the face of death. Imagining “if’s” and ways we could have prevented death is like standing on the beach and shouting at the ocean to stop the waves. We might jump to the miracle of Lazarus’ resurrection as the real sign of God’s glory that Jesus has in mind, but I think God’s glory begins a little earlier with Jesus’s emotional reaction. He is greatly disturbed and moved and begins to weep, to weep for his now dead friend. And so, the beginning of God’s glory is in God’s identification with, and participation in our suffering and grief. What does it mean for you that Jesus weeps with you in your grief, is moved deeply in your sadness, and joins with your family and community in your lament? Is this not the very reason the God of the universe pressed down into human DNA—into finiteness and limitation—so that we might know that God knows what it is to weep, to rage against death, and to be caught in the swirling “if’s” of what might have been? Isn’t Jesus’ expression of emotional pain a sign of the immediacy and intimacy of God’s glory, as are a stable and a bed of hay, the rough hands of a carpenter washing his friends’ feet, the simplicity of bread and wine and blessing? 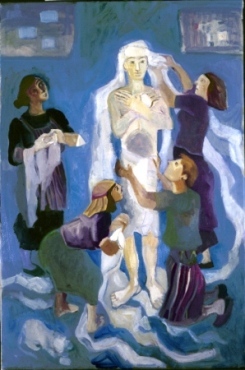 From this stance of solidarity with human sadness and powerlessness in the face of death, Jesus moves toward the tomb, and more than any other miracle story, Jesus asks for help. Jesus asks for the participation of the community. First, he asks for someone to “take away the stone”—a foreshadowing of his own resurrection (well this whole story is a foreshadowing of Jesus resurrection!). After offering a prayer of thanksgiving, Jesus then calls Lazarus forth by name, “Lazarus, come out!” And the dead man walks out. In this moment we see that in Jesus, we have life with God now and later—we have life with God on this side of the grave, and we have life with God beyond the grave—God’s glory is seen on both sides of the death. Jesus stands with us, weeps with us, and strengthens us in this life—and Jesus prepares a place for us in heaven through his power over death. But the miracle doesn’t end there. Lazarus is bound with the grave cloths of death, wrapped around his hands and feet and head. Jesus asks for help from the community once again, “unbind him and let him go!” Lazarus’s resurrected life does not begin until the community unwraps him and releases him. Why does Jesus wait two days until after Lazarus has died? Maybe, just maybe, Jesus wanted to focus Mary and Martha’s attention, and ours, not on scrambling to prevent a death over which we have no control, not on swirling in regret, and not agonizing over “what if’s,” but instead, on participating in life, aiding in resurrection, and helping with the miracles God is working in the midst of life’s grief. And there’s the fullness of God’s glory—in the community who joins Jesus in completing the miracle of new life by unbinding another. Grief is real and expressing its emotions is essential, but that’s not where God calls us to remain. Jesus calls to participate in life, even in the midst of our sadness. This is what eventually happened with my mother-in-law, Joan. She never got over the sadness of Cynthia’s death, of course. But she let go of the “if’s” because God called her and Dan’s Dad, a Presbyterian minister, to new ministries, even in retirement. Through this bigger heart of compassion created by her grief, Joan helped unbind others whose hearts were broken. God called her to keep participating in life, aiding in resurrection, helping the miracle of healing for others, and thereby revealing God’s glory and Jesus’ presence. For our Jewish neighbors in the aftermath of the anti-semitic murders in Pittsburgh, we can bring the gift of our own sadness and worship with them, stand with them, praying with and for them. In so doing, we can help unbind them from the grave cloths in which hatred has tried to wrap them. Jesus calls us to keep participating in life, aiding in resurrection, helping with miracle of healing for others, so that God’s glory and Jesus’ presence shine through. Two weeks ago, St. Luke’s hosted a training for Building an Inclusive Church that is fully and unconditionally welcoming of our LGBTQIA+ sisters and brothers. For generations, so many have lived and continue to live in fear of rejection by family, judgement by the church, being fired from their job, denied medical care, or worse, being victims of hate crimes. To make an explicit, public welcome and to hold fast to this banner on the altar that All Are Welcome, no exceptions, is to begin unbinding those grave cloths, and affirming that like Lazarus, there is life and community when you come out. Jesus calls us to help him unbind them from fear and rejection by affirming they are loved by God and welcomed by us, revealing God’s glory and Jesus’ presence. Today we remember the saints who have gone before us. As we give thanks for the witness of their lives and hold fast to the promise of their resurrection with Christ, we remember that Jesus is life for us here and now, and in the life to come. We cannot stave off death, and we cannot change the past. But we can trust that Jesus weeps with us, and then calls us from larger hearts of compassion, to participate with him in bringing life, aiding resurrection, and helping the miracle of healing as we unbind others. There are “no if’s, ands, or buts about it,” God’s glory and Jesus’ presence shine through us as we help others unwrap life anew.